Posted on February 12, 2019 by Anmol K.
The Other Side of Lost by Jessi Kirby is about 18 year old Mari Turner, and her quest to avenge her cousin, while finding herself. Mari cultivates a perfect life to her thousands of followers on social media. She posts inspiring messages and stories, but she does not practice what she preaches. On the inside, Mari is empty and can not keep up with maintaining this fake profile. So one day she breaks down and posts a video of herself confessing to what she actually thinks: she is not happy, and does not feel the inspirational message she spreads herself. Quickly, it goes viral, and pretty soon afterwards, she faces major backlash and people calling her a fraud. In order to escape all of this, Mari proceeds to hike the John Muir trail. She is doing this to honor her cousin, Bri, who was an avid hiker and died in an accident while doing what she loved. Her and Mari had made the promise to hike the trail together when they turned 18, but Bri did not make it till then. Mari has never had any experience hiking, but she feels that she should complete the hike for the two of them. With Bri’s diary and her hiking boots, Mari proceeds to hike the trail to the best of her ability; but it is much more than a simple hike because it helps Mari to see who she is without the people of the Internet. This book should be read by everybody because it can help teach us about ourselves. It tells us to take a step back and to be aware of what we value in ourselves. Kirby was able to depict the growth of Mari and she was able to let go of her grief while finding what she knows about herself. Simply put, this book can help people not only see the effects of negativity on social media, but how to be mindful ourselves of what we seek in life. 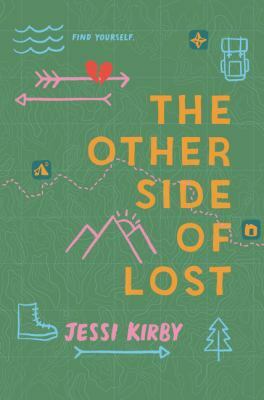 The Other Side of Lost by Jessi Kirby is available fro checkout from the Mission Viejo Library. This entry was posted in Book Reviews and tagged cousins, death, hiking, social media by Anmol K.. Bookmark the permalink. Looks fun!! I should read it. Mari is an authentic depiction of most of the social media user. This book sounds like a good read. The story seems completely relatable and modern.